Home	> 16. TANCHUMOS E-L. FIRST EDITION; SALONIKA 1578. THE R. NOSSON ADLER COPY. 16. TANCHUMOS E-L. FIRST EDITION; SALONIKA 1578. THE R. NOSSON ADLER COPY. A collection of sermons on the weekly Torah portions and festivals authored by R. Yitzchok Moshe ibn Arroyo.  R. Yitzchok Moshe ibn Arroyo was a student of R. Yosef Tiatzik and was counted amongst the esteemed Torah scholars of the well-known community of Salikona. In his introduction to this work, he describes how his entire family passed away in his lifetime except for one son. He thus named his work Tanchumos E-L (Consolation of G-D) based on the verse in the book of Iyov (15:11) pertaining to human suffering. At the end of the sefer there appears a poem in praise of the book by a contemporary Salonikan Jewish poet, R. Saadiah Longo. 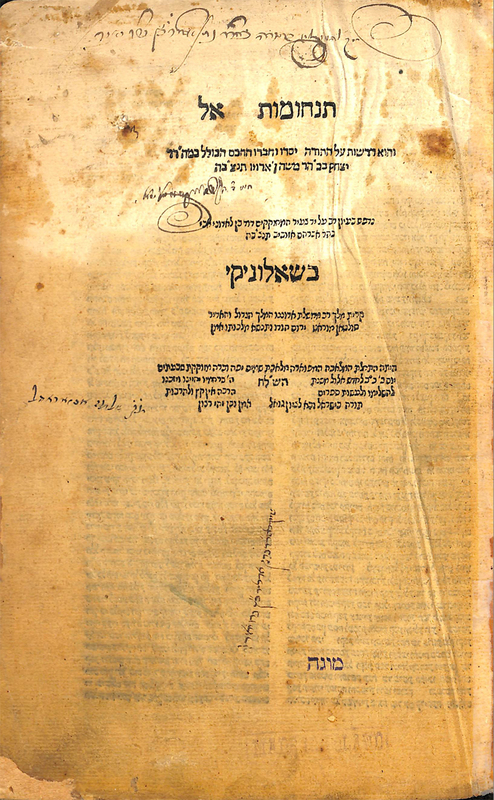 Printed during the prime era of the Jewish community in Salonika, on the press of the Azuviv family. This particular press was only active for about ten years, hence the scarcity. On the title page, there appears twice, in a hand from that era, that this sefer belongs to the esteemed R. Nosson HaKohen Adler.  R. Nosson Adler (1742-1801) was a student of the P’nei Yehoshua, R. Moshe Rapp and R. Dovid Schiff. Famed for his saintliness and sagacity, he served as Rav in various communities, eventually settling in Frankfurt where he taught a small group of elite students. His most prominent student was R. Moshe Sofer (the Chasam Sofer). 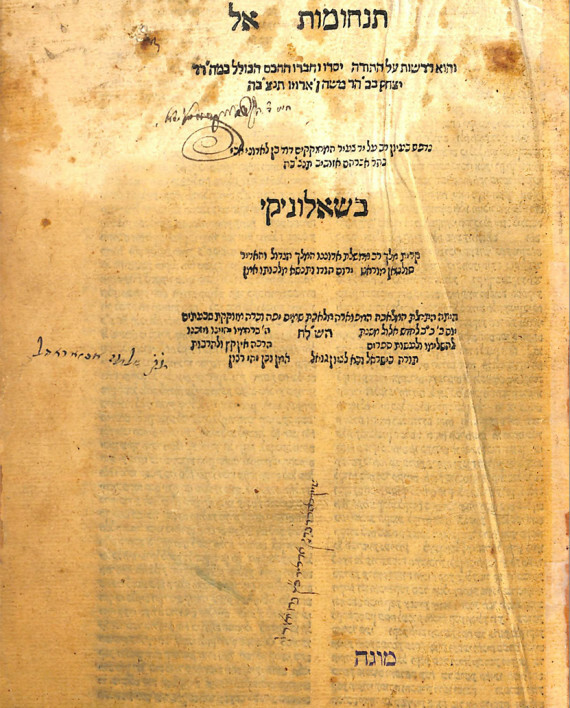 Additionally there appears a signature on the title page, seemingly of R. Shimon Halevy Segal, who was a brother in law and student of R. Akiva Eiger. Author of Sha’ar Shimon. Fair condition, some staining and markings. Extensive oil staining throughout, particularly to the final pages. Fine leather binding. Vinograd Salikona 100, Azuviv press. 158 pages, 29 cm.